For it's sheer juicing power relative to it's price, we've selected the Omega J8006 as our best masticating juicer as of 2018. As well as making beautiful juices, with high extraction, it has the most accessories and longest warranty of any model we reviewed. I’m a researcher too, and I’ve spent an embarrassing amount of time comparing juicers for HealthyButSmart. What you’re about to read is a top 5 list of masticating juicers I’ve been working on, checking and revising for almost 2 years. I’m pretty proud of myself! It’ll tell you which is the best for you depending on how you sit on a couple of key features: How much you want this, compared to that, compared to your budget. Peruse the list below and make your selection. I hope you find it helpful! 1 How Do We Rate Masticating Juicers? So, when it comes to determining which are the best masticating juicers on the market in 2017, how do we go about it? In measuring the best masticating juicers we use a set of five criteria. Given these criteria, what are the best masticating juicers in 2017? Let’s take a look. Omega J8006 is the workhorse of masticating juicers. It has been on the market for a number of years, and no company, including Omega, has been able to put together a better machine with essential features and a good number of accessories at an affordable price. It also hasn’t moved from the number 1 spot since I started this list. That alone should tell you something. With an MSRP of $299.99, it is more than $300 less expensive than the #2 Tribest Green Star Elite. But do not let the lower price fool you: the Omega J8006 is our #1 choice for a reason. First, the J8006 comes with a powerful two-horsepower motor that can grind its way through even the densest foods. The #3 Champion model only comes with a ⅓-horsepower motor, so you can expect to get a lot more out of this Omega. This power will come in handy, especially when you’re trying to squeeze out every last drop of fibrous foods like celery. Second, the Omega J8006 turns at only 80 RPMs, which slows down the process of extraction to pull every last drop of liquid out of any food. This is in stark contrast to the #3 Champion model, which turns at 1,725 RPM. This means the Omega will do a far better job grinding out dry foods and performing jobs like buttering nuts. Third, accessory-wise, this model comes with far more accessories than the #2 Tribest Green Star Elite. The Omega features six different nozzles and two screens, while the Green Star only comes with one screen and an adjustable pressure knob. This means that you will have a great range of options on what you can use your masticating juicer for. Whether you just want to juice, or you want to make butter from nuts, or you want to make baby food, the Omega J8006 can do it, and do it well with these accessories. The J8006 also comes in eight different colors (depending on availability). This gives you a wide range of options to customize your juicer to match your style, taste, or kitchen. Models like the #3 Champion only come in two colors (black or white). Finally, Omega offers an outstanding 15-year warranty on the J8006. The only model that comes close to matching a 15-year warranty (besides the other Omega on our list) is the #2 Tribest, which has a 12-year warranty. So, with the Omega, you will have peace of mind for many years that if your machine breaks due to defects, you will be covered. The Omega J8006 is continually reviewed by users as an exceptional machine. Consumers consistently report ease of use, quality of performance, and outstanding results. If you’re looking for the best masticating juicer for the price, the Omega J8006 is the way to go. Number 2 on our list is the Tribest Green Star Elite. With an MSRP of $629.00, it is more than $300 more expensive than the closest price (the #1 Omega J8006 model). This additional price tag is one of the reasons that the Green Star Elite came in second. However, for this additional money, you get some impressive features that will be quite appealing to advanced users. At the heart of the Green Star Elite is a dual gear system which provides for a greater degree of extraction than the single auger design of the #4 Kuvings model. The interlocking teeth of the twin gears will grind, press, and crush every last drop of liquid from the foods you put through the machine. This twin gear design is the largest advantage of the Green Star Elite and the main reason for the high cost. 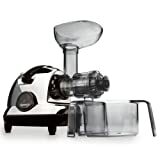 However, if you really want the absolute best performance from your masticating juicer, this model is your best option. In addition to the high-performing twin gear motor, the Green Star Elite is the only model on our list to come with an adjustable pressure knob. This allows you the greatest amount of control over how much pressure is exerted on your food according to how soft or hard it is. In this way, you will be able to get the greatest yield from the juices in your foods. However, there is a downside to this twin gear system and the adjustable pressure knob. The Green Star Elite requires a greater amount of skill and experience to operate than the ease of the Omega J8006. But if you are willing to put in the time or if you already know how to use a masticating juicer well, then the Green Star Elite will give you better results. Finally, the Green Star Elite comes with a great warranty of 12 years. While this is three years less than the Omega J8006’s warranty, these are still industry-leading warranties from two great companies. And Tribest has an excellent reputation for customer service. Overall, the Green Star Elite is “elite” for a reason. If you only want the absolute best and money is not a problem, this model is the best masticating juicer. If you’re the type of person who wants to be able to have more control and to juice practically any food, you cannot go wrong with this juicer from Tribest. The Champion Juicer has been a mainstay of masticating juicers for a number of years. Its MSRP of $295 puts it at about the same cost as our #1 Omega J8006 model. There are a number of reasons that the J8006 beat out the Champion Juicer, but this model is an industry leader nonetheless. EASY TO OPERATE - Simple put in your veggies and get juicing in no time! HEAVY DUTY, DURABLE PARTS - High-quality parts, made to stand up to juicing lots of tough vegetables. STAINLESS STEEL SHAFT - Provides for longer wear especially under heavy use conditions. LATEST DESIGN - Giving you the best version, so you can make the best juice. One of the first things you will notice about the Champion Juicer is that its body is made of a durable nylon. Other models like the Omega J8006 have a plastic body, which will not hold up to the same stress as the Champion’s nylon. While the material certainly isn’t indestructible, its advantage rests in that the nylon will flex instead of cracking. This makes it more durable than other models. The Champion is also a bit heavier than other models, weighing in at 25 lb compared to the #4 Kuvings’ 17 lb. This adds to the Champion’s durability and stability during the juicing process. You just need to make sure you’ve got the muscle to move it around if necessary. 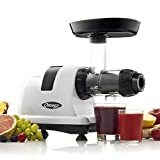 Another major difference between the Champion and other models on our list is that the Champion juicer spins at a much higher rater than all the other models. For example, the Tribest turns at 110 RPMs, but the Champion turns at 1,725 RPMs. This has both advantages and disadvantages. This speed is usually more associated with vertical blenders, which use centrifugal force to juice foods. These kinds of speeds are much more suited for juicing soft foods like fruits, but they have a more difficult time with dense foods like wheatgrass and kale. Because it spins at a higher rate, the Champion will also be rather loud. While the #2 Tribest is the quietest model on our list, the Champion is easily the loudest. If you are concerned about noise levels (like waking people up in the morning because of your juicer), you should keep this in mind. The warranty on the Champion is not quite as impressive as the first two models. Whereas the Tribest comes with a 12-year warranty and the Omega J8006 comes with a 15-year warranty, the Champion really only comes with a five-year warranty. We say “really” because Champion provides different warranty terms for different components of the juicer. The five-year warranty only covers the parts that come with the juicer. The motor has a three-year warranty and the cutter has only a one-year warranty. So you do not quite get the same warranty protection with the Champion, but they have an excellent reputation for standing behind their products. The Champion also only comes in two basic colors, black and white. So you do not have many options if the look of the juicer is important to you. Champion also only supplies this model with one cutter and one screen compared to the six nozzles and two screens of the #1 Omega. You will still be able to juice most foods; this just means you will not have the customization to get exact results. So, if you are looking for the best masticating juicer to handle soft foods, the Champion is a great option. If you will primarily be making fruit juices instead of trying to extract liquid from foods like kale, you should consider the Champion Juicer. The Kuvings Masticating Slow Juicer is a great compromise between price and features. With an MSRP of $230, it is the least expensive juicer on our list; the closest model to this is the #1 Omega at $299. There are a few important differences between these two juicers, but the Kuvings is great for when you want more options but do not quite need the power. The motor on the Kuvings juicer is 170 watts and turns the auger at 80 RPMs, the same as the #1 & #5 Omega juicers. This provides you with excellent slow churning extraction for dense foods, and you will be sure to get every last nutrient out of all your foods. With the slow turn, much less heat is generated, which preserves the food quality. One of the nice features of the Kuvings model is that it has a recently redesigned feeding tube. The juice will automatically feed foods into the juicer so that you do not have to force foods down in the auger. So much less effort is required to operate the Kuvings than the Tribest juicer, which requires constant tuning. With the Kuvings, all you need to do is insert your food and it will take care of the rest. You also get the widest variety of nozzle attachments from any juicer on our list. While the #1 Omega juicer comes with six nozzles, the Kuvings juicer comes with seven different nozzles. This gives you more options for the kinds of foods you can process. Whether you want to make butter, sorbet, baby food, or juice, you will find a nozzle for your application. If you do have trouble with the Kuvings juicer, it is equipped with a reverse function that will allow you to unjam or unclog the machine. But Kuvings has made this just as easy as operating the juicer when you don’t have a clog. With just the flip of a button, you can clear the path and get back to juicing. Kuvings supplies a five-year warranty with this model, which is considerably less than the warranty on the #2 Tribest and the #1 Omega. However, five years is still a generous warranty and Kuvings has a good reputation for dealing with customer issues. It also comes with a wider variety of colors than the #4 Champion. While the Champion model only comes in black or white, the Kuvings juicer comes in four models to choose from (chrome, green, silver, white). So, if you’re looking for a decent juicer with lots of features that won’t break the bank, this model from Kuvings is an excellent choice. Number 5 on our list is another great juicer from Omega. The NC800 is a newer model from Omega with a few modifications to the J8006. These features mean that it is a bit more expensive than the #1 Omega. The MSRP of the NC800 is $329.99, while it’s only $299.99 for the J8006. However, the upgrades provided to the NC800 weren’t quite enough to justify the added cost in our research. Like the Omega J8006, the NC800 comes with six nozzles, two screens, and a 15-year warranty. So, in these respects, the two models are identical. The difference is that the NC800 comes with an adjustable end cap, while the J8006 is fixed. This means that you can control the consistency and level of juice that is extracted from the machine. With the possibility of a wider chute, you will be able to get higher juice yields from the NC800. However, this will require more control from the user, and the average person will probably not notice the difference. In this sense, the NC800 is similar to the #2 Tribest in that both require more manual input from the user. The other models on our list are easier to use. So you should consider your level of comfort operating these machines. If you are unsure of the best way to use them, then all things being equal, the #1 Omega would be a better choice. However, if you are confident that you know or can learn how to get every last drop out of your foods, then the NC800 is a great machine. The powerful motor and slow-churning auger make the NC800 an excellent masticating juicer for extracting juices from leafy greens like wheatgrass, kale, or parsley. It can also make great butters and sauces with the additional nozzles and screens that Omega supplies. OK, so you really want a masticating juicer, but you don’t want to drop over $200 for it. Are there any options? Yes! If you’re on a tight budget, here are the top 3 masticating juicers that you can get for less than $100. Unlike the top 5 masticating juicers, these inexpensive models are all vertical juicers instead of horizontal juicers. This means the motor and gear are aligned vertically so that the pulp and juice are extracted out of the two separate spouts on the side of the juicer. This process isn’t quite as efficient as the horizontal process, which is why they are less expensive. So let’s take a look at the models. This model by O-Breko will give you the highest yields of juices compared to the other inexpensive models, but it will also cost you the most. The 200-watt motor drives the auger at 65 RPMs, which is even slower than any of the top 5 models on our list. The powerful motor will drive a double-edged Tritan auger at these slow speeds so that you can get the most out of every drop of food or vegetable. Keep higher nutrition. O-Breko slow Masticating juicer produces full and precious vitamins and minerals. All parts on the O-Breko are BPA-free so you know it is safe for your whole family. It is quite loud with a rating of around 65 dB, which means it is louder than any of the top 5 masticating juicers. If early-morning juicing is what you’re after, you might need to take this into consideration. O-Breko includes two spouts and two containers to catch both the pulp and the juice as it separates them. This makes it nice and easy to collect excess pulp and throw it away or compost it without any difficulty. However, while several of the top 5 models featured several nozzles and screens, the O-Breko does not come with any additional accessories of this kind. This does mean that this model is simple to use since you do not have to worry about the proper accessories for different types of foods. The O-Breko comes with a one-year limited warranty and has a good reputation for customer service. If you’re looking for a good, basic juicer that will give you decent yields from softer foods, the O-Breko juicer is a great option. This model offered by Chef’s Star is generally less expensive than the #1 O-Breko model. While the O-Breko offers a 200-watt motor, the Chef’s Star only comes with a 150-watt motor. However, you are unlikely to notice this slight difference in performance. Both juicers are powerful enough to slow-churn soft foods into juices. Because of the design, the operation of the Chef’s Star is quite simple. There are no complicated tools or screens to use to get the most out of your foods. It is also quieter than the O-Breko, so this might be a better option for those who have to be conscious of others in the house. Furthermore, the Chef’s Star is very easy to clean. The different components come apart without difficulty and without any hassle. The horizontal masticating juicers in our top 5 list all require a little more effort and working with the parts to get them apart and cleaned. If you are new to juicing, this is one way to ease into the process. This model also comes with a one-year limited warranty to cover any initial problems with manufacturing errors or parts defects. While this isn’t any longer than the other inexpensive models, it does give you the standard coverage. 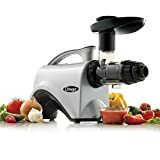 If you’re looking to save a few more dollars on a decent juicer, the Chef’s Star will perform generally as well as the O-Breko and turn a bit more quietly. Last on our list is the slow juicer by VREMI. This juicer, like the O-Breko, comes with a 200-watt motor and turns at 80 RPM. In this way, the inexpensive juicers all have comparable motors and speeds. Where the VREMI stands out is in its unique cleaning system. MAXIMIZE NUTRITION: The Vremi Slow Juicer retains nutritional value and flavor from fruits and greens. NOURISH YOUR BODY: Fresh juices retain substantially more nutrients and vitamins than store bought varieties. While the Chef’s Star and O-Breko are easy to clean, the VREMI features an auto-clean function. This makes it even easier to clean than any other model on our list. To give the VREMI a quick clean, all you have to do is run warm water through the juicer as it self-washes. When the water comes out crystal-clear, the juicer is ready to be used again. This keeps you from having to completely disassemble the machine just to switch the foods you are juicing. The VREMI also features a reverse option in case the juicer should get clogged. This may happen, especially with more fibrous foods like celery. With the reverse option, you will be able to clean out anything stuck in the machine without any trouble. Another nice feature of the VREMI slow juicer is that it comes in three fun colors. The O-Breko and the Chef’s Star only come in a single color, so the VREMI gives you more options. This allows you to customize the look you want for your juicer so that it doesn’t have to be hidden away when not in use. If you need a reliable juicer for as little as possible, the VREMI is a great option. So there you have it! If you really want the best bang for your buck, the #1 Omega model will extract all the juice you want from even the densest foods. If you are a more experienced juicer and know how these machines work, then the #2 Tribest is the way to go. It will cost you considerably more than all the other models, but you will get the highest yields of any model. 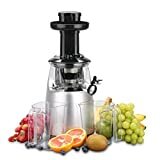 If you are looking for a juicer for primarily soft foods like oranges, tomatoes, or grapefruits, then the #3 Champion is a great option due to its high speed. If you need more options, then the #4 Kuvings comes with the most accessories and will allow you to customize your juicing experiencing to the greatest degree. Or if the #1 Omega appeals to you, but you’d like the customization of pressure control, then the #5 Omega NC800 is a great model for you. Whichever model you choose, these top 5 models are sure to deliver you with many, many cups of great juices, butters, and sauces! This post is great! Thank you very much! Thank you for the info. Very helpful. Will be using one of them as a grater. I am looking into omega 8006. I’m trusting what I read. I agree…great post! Very well written, easy to understand..you have taken the leg work out of a decision that seems daunting to me!